These dumplings are simple to make, though the filling and folding process can take a little time. (Just turn on some music and try to enjoy the process!) You can steam them, pan-fry them, or use them in wonton soup. I’d tell you that they’re also freezable, but I’ve honestly never had a situation in which there were dumplings available to freeze, because no matter how many of these I make the guys always polish them off. In a medium bowl, combine the ground pork and silken tofu. Mix well with a fork until the ingredients are well incorporated. Add the scallions, ginger and tamari. Mix thoroughly. Line a large baking sheet or tray with parchment paper. Place about 1 teaspoon of the pork filling in the center of each wonton wrapper. Using a fingertip, moisten the edges of the wrappers with water. 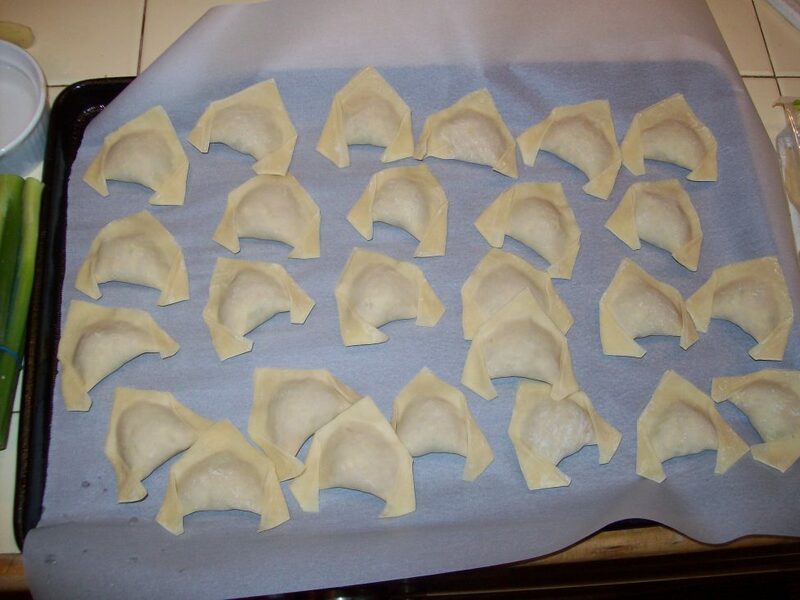 Fold the dumplings into triangles by bringing one corner across the filling to the diagonal opposite corner. Press firmly around the filling to squeeze out any air, then pinch the edges of the dumpling to seal. Fold the two corners of the long edge downward and pinch to secure. Repeat the process with all 24 dumplings. To steam the dumplings: Working in batches, place the dumplings on a steamer rack over boiling water and cook, covered, for 3-5 minutes, until the wrappers are translucent. To pan-fry the dumplings: Coat the bottom of a heavy skillet with a high-heat oil of your choice. Add the dumplings in a single layer, taking care not to overcrowd, and cook for 2-3 minutes or until they’re browned on the bottoms. Carefully (very carefully — watch for splatters!) add about 1/2 cup of water to the pan, cover, and cook until the wrappers are translucent. Remove the lid and continue to cook until the water has all evaporated. To use in soup: You can either follow the steaming method above, then simply float the dumplings in your soup broth; or you can cook the dumplings directly in simmering broth. (Don’t cook them in broth that’s up to a full boil — that can break the dumplings open and create a real mess!) Just gently slide the dumplings into the simmering broth of your choice and cook for 3-5 minutes, until they’re fully translucent.